Linda Miller Nicholson is the living patron saint of pasta. From her flour-dusted kitchen near Seattle, Nicholson spreads the gospel of gnocchi and pappardelle; cavatelli and farfalle; raviolini, rigati, fettuccine, rigatoni, garganelli and culurgiones. 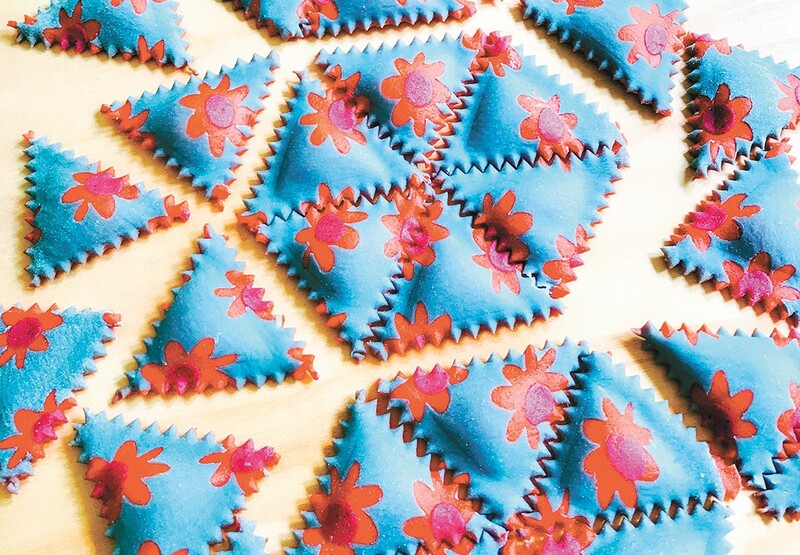 The self-proclaimed "pasta ninja" has in recent years amassed an impressive following on social media — she posts on Instagram as @saltyseattle — for her handmade pasta's complex shapes and patterns, and bright and unusual hues: purple, blue, green, black and even rainbow-striped noodles. She's made custom pasta for celebrities and has been featured by outlets like the Food Network, BuzzFeed and more. Now, she's celebrating the launch of her new cookbook Pasta, Pretty Please and hoping to encourage others to try their hand at making fresh pasta tinted with natural plant-based dyes. "Pasta is not like pie dough. It's not like making cake. It's extremely forgiving and it's not an exact science," Nicholson explains. "If it sticks to your fingers, you add flour, and if the dough is crumbly and too dry, you add more liquid." While about half of the book's recipes are designed for more advanced pasta producers, Nicholson says anyone can start learning how to make their own Italian-style noodles with only flour, eggs, a rolling pin (even a wine bottle works as a substitute) and a flat surface. To beginners, Nicholson simply says: "Jump in." "I've made pasta with 5 and 85 year olds. People find they have a great sense of accomplishment when they are done and are super proud of themself," she adds. To share this handmade pasta evangelism, Nicholson is coming to Spokane on Saturday, Dec. 15, for an intimate pasta-themed luncheon at Sante Restaurant & Charcuterie (it's sold out) followed by a free public reception at Auntie's Bookstore, where she'll meet fans and sign copies of her joyfully written and beautifully photographed cookbook. Both events are co-hosted by the Spokane Culinary Arts Guild. Nicholson's devotion to the art of mixing together eggs, flour and color-rich vegetables dates back to childhood when, at age 4, she recalls learning how to roll out pasta dough in her grandmother's kitchen. A love affair with Italian food followed in her teens and early adulthood (including time spent living in Italy), but it wasn't until later that Nicholson's passion for pasta making was truly ignited. About five years ago, her then 5-year-old son Bentley was going through a particularly picky eating phase, refusing to eat any vegetables. Just when she felt out of options, Nicholson had an epiphany: She'd make colorful pasta for her son, secretly dyed with healthy veggies! It worked. Bentley didn't see or taste the hidden veggies, and eventually overcame his picky phase. Nicholson, meanwhile, had discovered her true calling. "I felt like I was sort of always looking for my [creative] medium, and never felt like I could find it," she recalls. "I thought I could design clothing and that I could paint... I continued to knock on doors and pursue things until I realized that pasta is the one thing I spend more time doing than anything else. Not only did I find my medium, but something that really resonated with a lot of people." Inside Pasta, Pretty Please, Nicholson shares her carefully crafted and meticulously tested recipes for 25 versions of pasta dough colored with ingredients like paprika, tomato paste, blueberries, beets, activated charcoal, leafy greens, mole, turmeric and more. Instructions follow on sheeting pasta and cutting it into different shapes, from long tajarin noodles to rolled gnocchi. The last chapter contains Nicholson's recipes for simple and traditional Italian sauces. Before cooks get into the actual how-to, though, they learn more about Nicholson's personal journey to pasta prowess, along with helpful tips on selecting quality ingredients, pasta cooking methods and necessary kitchen gadgets and tools. "I think maybe my favorite piece of feedback I've gotten is that so many people thought it was going to be just a cookbook, but I didn't realize I was putting all this voice in here," Nicholson says. "Many people read it cover-to-cover and sent messages saying, 'Wow, it's like you're in the kitchen with me!'" Now that she's successfully published her own pasta bible, Nicholson is next working on custom building a new pasta-making workshop on her semi-rural property about 25 minutes east of Seattle. She plans to use the space to shoot instructional videos and to teach classes for the public, which has always been an important focus of her work, versus selling her pretty pasta via traditional retail. The original print version of this article was headlined "Starchy Sorcery"